From across the dark water, it looked like fairy lights had been flung against the jagged mountain slopes. Forming arcs and triangles, occasionally broken by backlit towers, Kotor’s twinkles put on quite the show. “You see…” Slavko my guide explained, “The lights form the shape of an old man. He guards this city”. 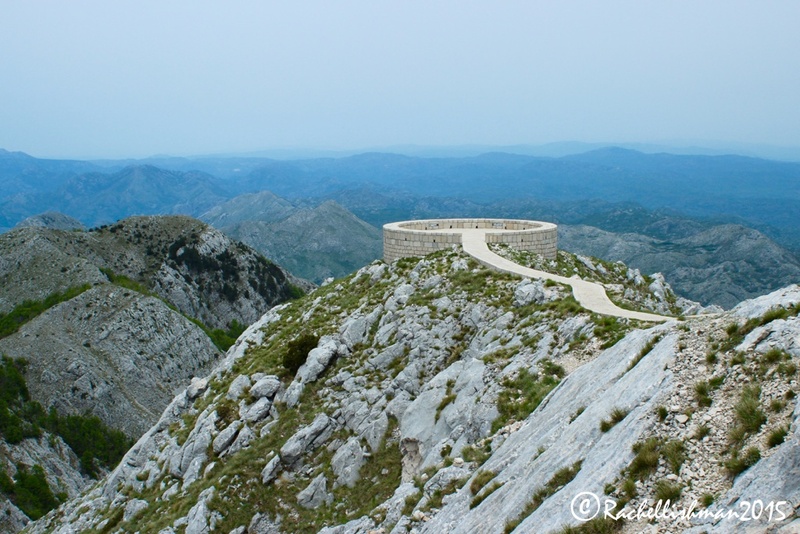 It had been a full and at times, alarming day’s drive through the Montenegrin Mountains. With Slavko more or less at the wheel, give or take a few irate mobile phone calls, we had covered some fascinating ground. We left early and via an abandoned WWII bunker, now only home to nesting swallows, veered sharply upwards into Lovcen National Park. Like the Slovenians, the Montenegrins make a habit of numbering their hairpin bends. What’s normally considered a cute idiosyncrasy was for me, and anyone else who’s ever been Slavko’s passenger, a constant reminder of the opportunity to plunge to our death off the sheer limestone precipice. Not long rid of its snow, Lovcen’s air still had a freshness to it that shook off a Rakia-induced fuzziness from the previous night. A tiny shack served steaming hot coffee behind a solitary picnic table. Together with shallow green dips in the high plateau housing red-tiled chalets and tidy smallholdings, it made the perfect picture. We were in Lovcen for a different reason: The final resting place of Petar II Petrovic-Njegos, a nineteenth century Prince Bishop, was originally built by the man himself but sadly destroyed during World War I. Despite controversy, a new building now ensures that the renowned poet can protect his favourite view. On clear days you can see Croatia, Bosnia, Albania and even Italy across the Adriatic if you’re very lucky. 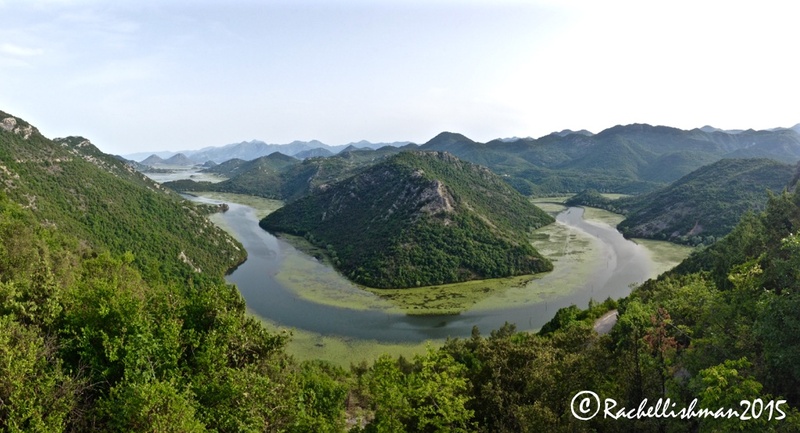 From the wilderness we continued downward and inland to Cetinje, Montenegro’s old royal capital. Today it’s a university town focussed on the arts, with a wacky mayor who insists on painting bright hues over every scrap of original architecture. While sensitive renovators would have baulked, these colours only seemed to add to the place’s quirky charm. Shrill orchestral music wafted out of windows of multi-coloured embassy buildings as old men sipped coffee on shaded pavements. Behind the town, through golden fields of buttercups under the hills, habited monks carefully guarded relics (one of which is rumoured to be the right hand of John the Baptist) at the celebrated Cetinje Monastery. After a wonderfully heavy meal of potatoes and goulash we doubled back towards the coast. Travelling on narrow, pot-holed roads we passed through a nature reserve heaving with bird life. Mercifully, the views provided a brilliant distraction from the terrifying twists and turns: Colossal wooded karsts shaped green inlets where all wildlife is now government protected. 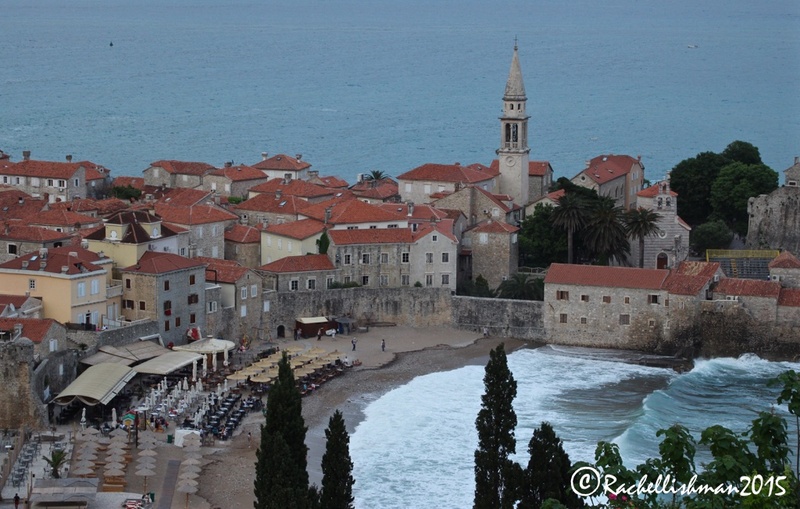 Our coastal destination was Budva, which at 2,500 years settled is one of the oldest cities on the Adriatic. The sight of bikini-clad shoppers perusing dilapidated streets of designer stores initially disappointed me, but the town’s redeeming feature is its medieval walls. Now only guarded by hotel security, the ancient ramparts with their crashing waves are best observed from up on high with a cocktail in hand. As the sky turned to mauve over Budva’s beaches, I wanted to be back in Kotor. I missed its hidden doorways, fortress churches and dainty town squares that gradually quieten as the cruise ships leave each day. We weren’t far: Thirty minutes drive on our first modern motorway of the day brought us back to a blackened version of the town I knew. A city worth protecting: That old man in the mountain has an important job to do. It looks so remote. The platform on top of the mountain looks so out of place, but the view must be spectacular. Beautiful pictures Rachel. It looks magical.